Before attaining the title of Dragon Mage, Sorchen warriors must endure numerous trials of endurance, willpower, intelligence, strength, and discipline. Should the warriors pass these trials, they are given the title and a bonding mark called a kuse (humans now call them tattoos). 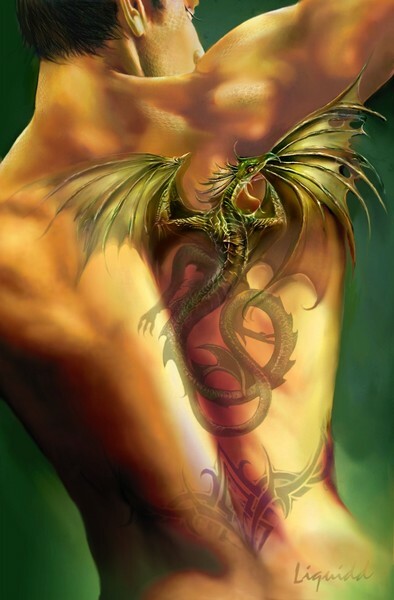 This mark is made by embedding blood from a live dragon into the warrior's skin and creating the image of a dragon. The reason for this mark is twofold. Firstly, it bonds the warrior to the dragon. Many warriors even gain physical characteristics of the dragon (such as scales and claws)the more they use their mage powers. Secondly, dragon's blood outside of a dragon's body becomes a sentient symbiotic lifeform and through intense mental concentration a dragon mage can call forth and control this lifeform. Otherwise, it retains the image of the kuse created on it's host. This piece is of Merrick, a Master DragonMage, after first receiving his kuse. More about Merrick will unfold in my Sorche novel. MAGNIFICENT!!!!!!!! THEY NEED YOU IN THE MOVIE INDUSTRY.....! I love how this dragon is flying out of this tatoe! !